We are a leading Exporter of kundan ruby necklace sets, kundan bracelets, bridal jewelry sets, kundan meena polki ring, kundan necklace set and kundan necklace sets from Jaipur, India. We hold expertise in manufacturing and supplying an exclusive collection of Kundan Ruby Necklace Sets. Our set are widely praised for fine finish, elegant designs and attractive look. Creatively designed these set are available in various styles and patterns as per the demands of fashion loving ladies. Reasonably priced these set are available in all standard sizes and designs. These are offered with attractive jewelery case which retains their shine for long life. With the constant support of our experts, we are fulfilling the varied requirements of clients by offering Kundan Bracelets. Designed in line with the contemplation of contemporary fashion trends of the markets, these offered bracelets reflect rich Indian culture too. Our kundan bracelet is provided in customization options as per specific requirements of our clients. This kundan bracelet is checked by experts in order to guarantees its quality. Enriched with vast industry experience, we have been able to manufacture and supply an exclusive range of Bridal Jewelry Sets. Creatively designed these set are widely praised for appealing look, elegant designs and excellent finish. Customers can avail these set in variety of designs, patterns, finish and styles as per their demands. These are available at reasonable prices. Attractively designed our jewelery set reflects the hard labor of our designers. Owing to our extensive years of industry experience and profound market understanding, we are providing Kundan Meena Polki Ring . Our offered polki ring is designed with utmost precision using quality-tested basic material and latest techniques as per trends of market. Furthermore, our provided polki ring is ideal to be worn in parties and evening functions and is thus. 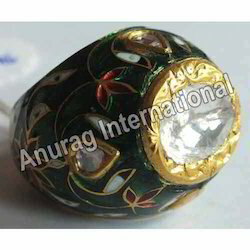 Clients can avail this polki ring from us at market leading rates.